One more award proving our commitment and professionalism! 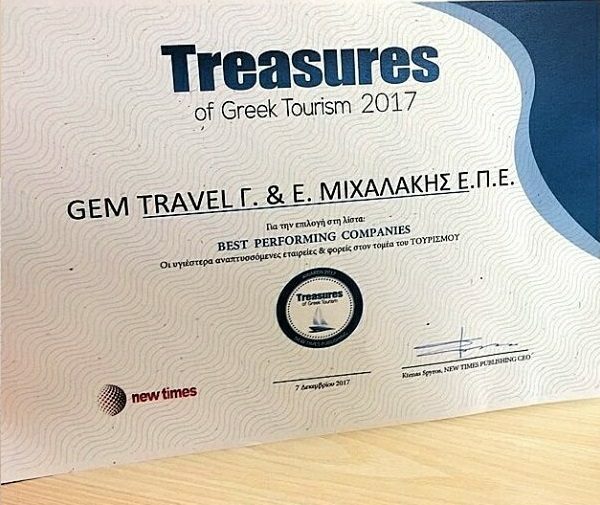 GEM Travel was awarded a “Best Performing Companies Certificate” at the Treasures of Greek Tourism 2017 event, which was held on December 7th in Athens! 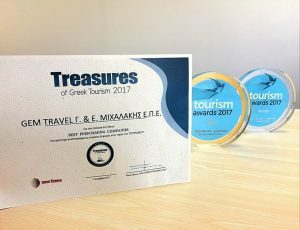 This is the 3rd award of the year, following the Gold one for Best New Solution in Tourism and the Silver one for Customer Services, at the Tourism Awards 2017 held in March! The ccertificate was introduced to Mr. George Michalakis (CEO) and Mrs Eudokia Michalaki (CFO).